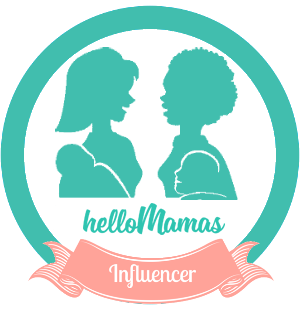 In addition to gushing over these gorgeous items, you will have a chance to win one of the featured toys for your own important little person. There are nine amazing toys and each one of these items will go to the homes of nine happy children this Christmas. I am so excited for you all already! 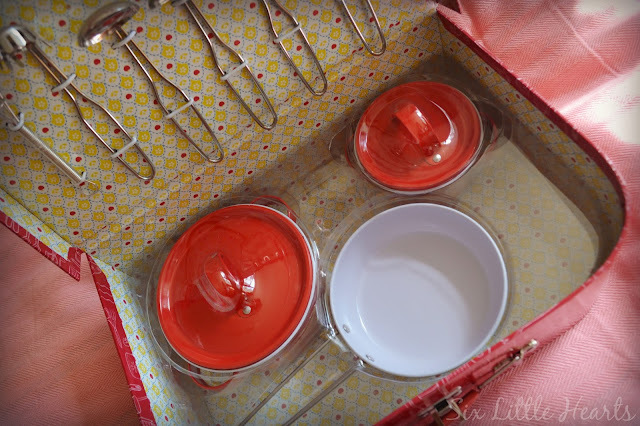 Inside the adorable little red carry case are six metal utensils, two saucepans with lids and a frying pan. Don't they just look like the real-deal?! We parents know that having the real thing, (or as close to it as possible), is so important to little kids. 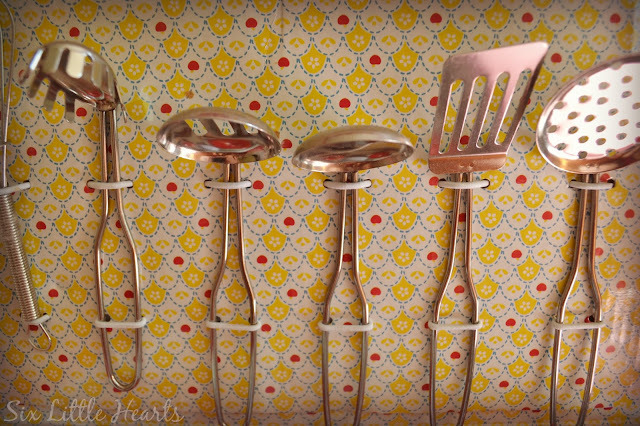 We especially admire the tin utensils in this set, after all, which adult amongst you has ever laid eyes upon a kiddy-sized spaghetti ladle this authentic? This glorious kitchen play set is recommended for ages 3 plus and retails for $31.95. (It would make ideal serving-ware for your own child's grass soup concoctions over the approaching long, hot summer break.) Mmm! 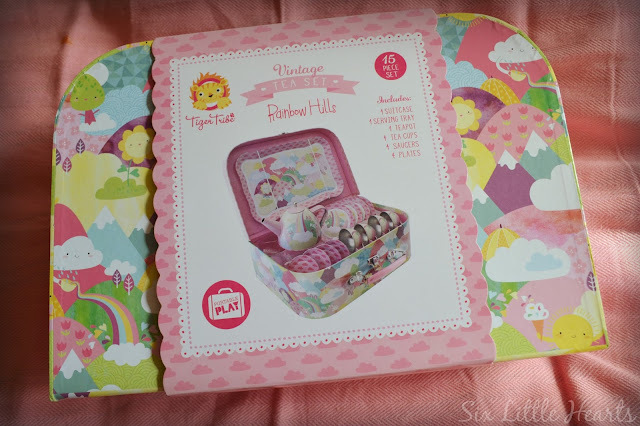 Another adorable kiddy play item - the Tiger Tribe Vintage Tea Set Rainbow Hills. This is an all-new release and there are other items in this Rainbow Hills range such as matching jewellery boxes. Co-ordinate your child's collection or make a sweet bedroom display. 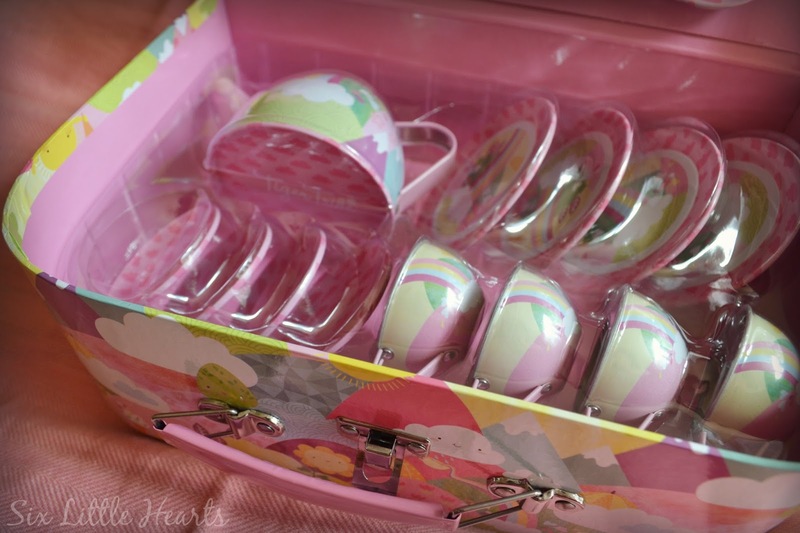 There are 16 pieces of tea-time fun for kids tucked inside yet another beautiful carry case. Within you'll find everything your child needs for a memorable tea occasion: A tin teapot, 4 tin tea cups and saucers and 4 tin plates. It's bright and joyful and you may find you will happily join in the fun with this one. 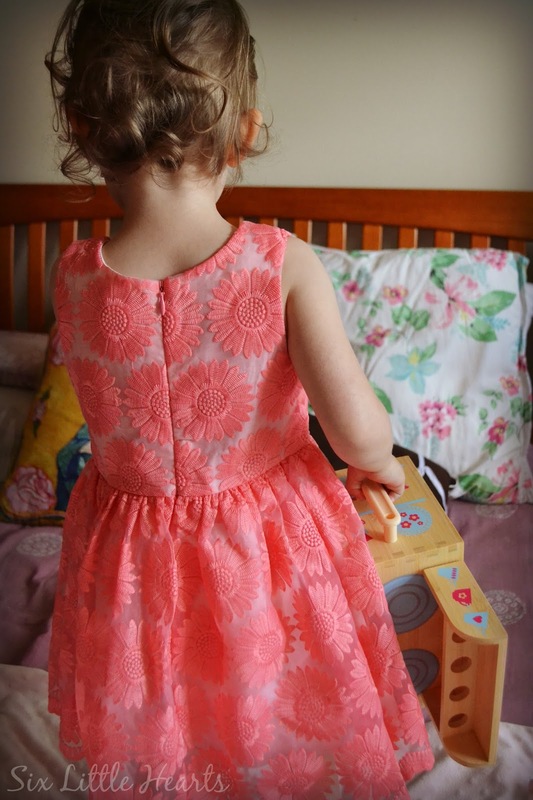 Suitable for ages 3 plus, this lovely retails for $35.95. Oh boy, we think this next one's fannnnntastic! If you've ever experienced the magic of an Aquadoodle, then this plaything is bound to impress. Being a mummy who dislikes crafty mess, I really appreciate the successful marriage of art and mess-free fun in this one, great, play item. This is the Tiger Tribe Magic Painting World A Day At The Palace. There's also a boy version available (Things That Go). Inside each set is a magic pen which you fill with water and four play scenes which are revealed as your child 'paints' with the water pen. Kids can find hidden joys as they draw and once the play scene dries, the boards return to white. These can be re-used time and time again. 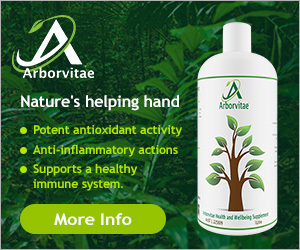 Ideal for car trips, travel and boring visits anywhere with grown-ups. This would easily fit into a nappy bag or cabin bag. Tiger Tribe's drawing sets, (image below) are easily some of my own children's most used play items from this brand to date. We were so pleased to find two new sets in this year's box of items for review. Our previously gifted sets are tattered and worn after an almost weekly workout since they arrived in our home. My kids love these! Inside this kit is 48 colouring pages, 10 high-quality double sided markers (both a thick and fine tip), 6 full-colour sheets of stickers and it all stores within the hard cover within two compartments that really go the distance. It may sound minor, but these are huge with kids and they last for ages so they're great value too at $19.95. 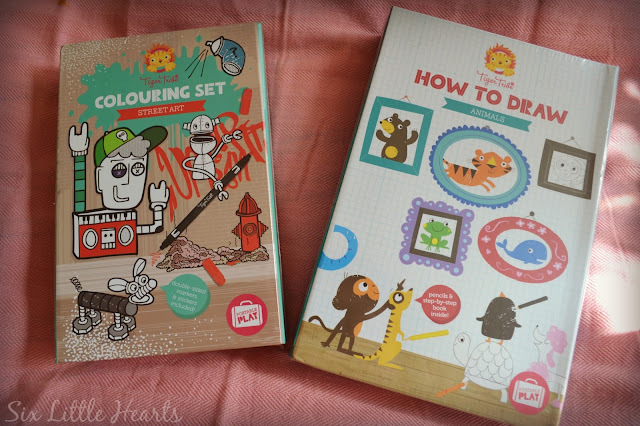 On the right, The Tiger Tribe How To Draw Animals kit. Again, hours, (months!) of fun for the 5 plus age group. This one is going to my 7 year old this Christmas too. He will be thrilled. Inside is a How To Draw book, a 50 page sketch book, colour pencils, a sharpener and an eraser. This one comes with a RRP of $17.95. Can't recommend highly enough. These are quality boredom busters. Tiger Tribe's Magnificent World of ABC. 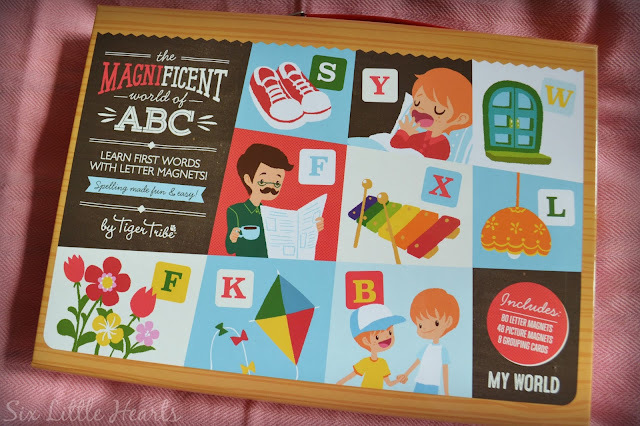 Teaching kids letter and word recognition takes on a whole new appeal with this beautiful set. Books are indeed great when it comes to learning about language but there's definitely a lot to be said for the more tactile approach to learning to read. This set offers just that. 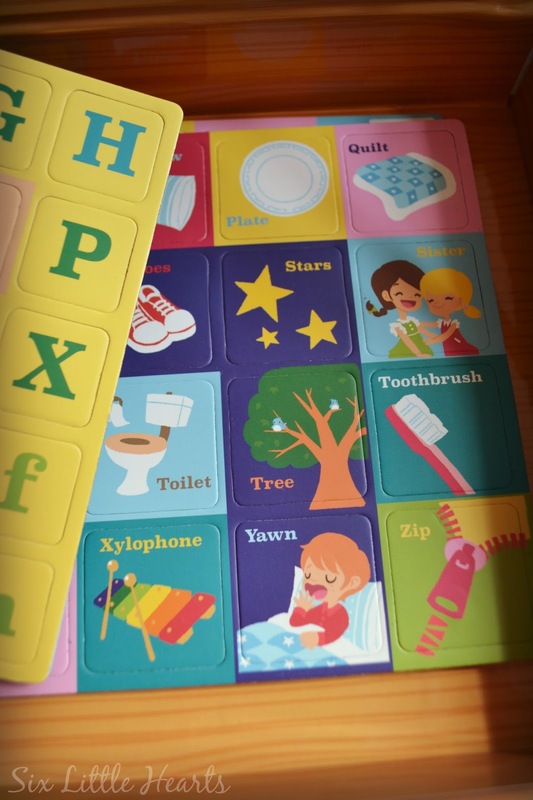 There are 80 magnetic letters in upper and lower case, 48 picture magnets and 8 grouping cards. This set is suitable for kids from 4 years of age and retails for $34.95 on the Tiger Tribe website. to spell out the words on the card. Tiger Tribe's Boxset range are amazing! (There's another of these reviewed in more detail below.) These are take anywhere wooden boxes and inside is a whole world of fun and adventure. All the parts pack within for easy and compact carry. They even have a sturdy carry handle so that little ones can do their own lugging. The sets are beautifully painted throughout for hours of play fun. This beautiful Fairy House Boxset contains a quality wooden world of imaginative play with two fairies, a rainbow stairway, magic swan, a toadstool furniture setting and a lily pad bed. These are crafted in eco-friendly birch plywood. Tiger Tribe are Boxset's exclusive distributor in Australia. RRP $59.95. Tiger Tribe's Wooden Pirate Skittles are all wood and inside the easy-carry package are 6 skittles and two wooden balls. They're active fun with an age range of 3 plus. RRP $19.95. Remember the Fairy Boxset? Well, this next one is the Boxset Role-Play Kitchen. 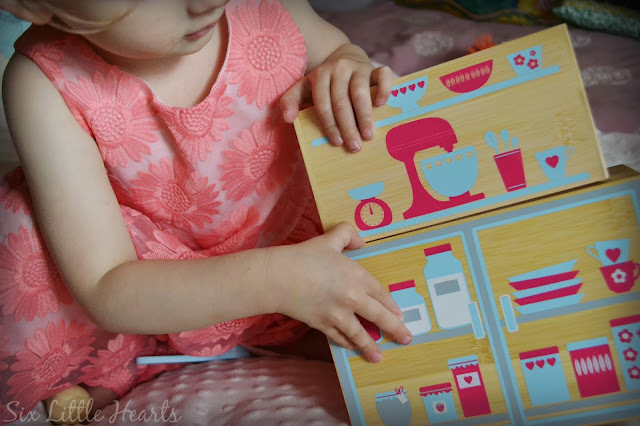 This beautiful carry-along kitchen has been an enormous hit with my little girl. Everything has been thought of with this toy and my daughter just adores cooking mini-meals for the rest of the family with this. 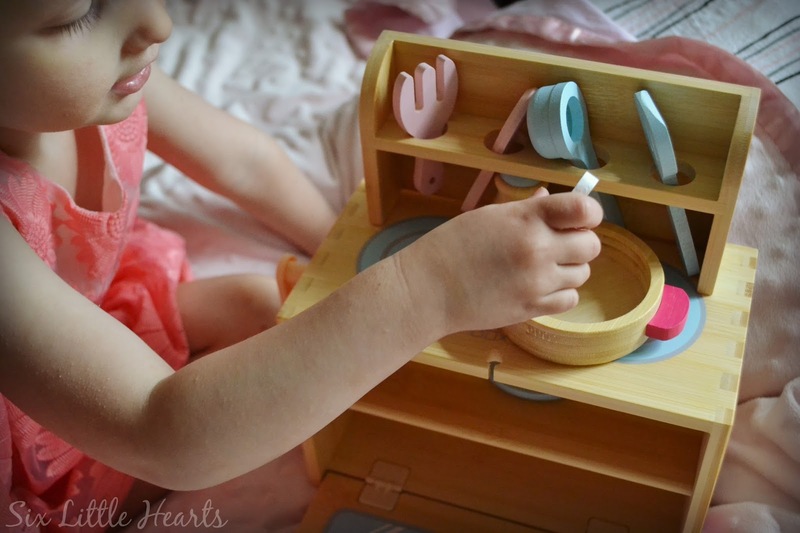 It is a lovely little set which she enjoys using at the kitchen bench while mummy cooks too. When dinner time is complete, it's as simple as storing all the kitchen utensils and the detachable buffet hutch within the box, fix the closure and walk away. The Boxset Role-Play Kitchen retails for $59.95 on the Tiger Tribe website. Utterly adorable! 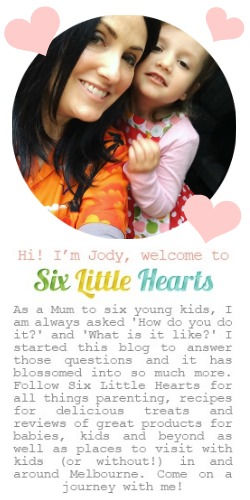 Nine Tiger Tribe prizes for nine Six Little Hearts followers! Merry Christmas! *Please refer to the above review for individual prize values. Entrants are asked to enter their full name, address and postcode details as well as a contact phone number on the entry form below. If you are a winner, this will greatly increase the likelihood that your prize will reach you prior to Christmas. Please ensure you complete this important step accurately. Your information is only shared with Tiger Tribe for prize distribution. Entrants must leave a comment along with the prize they would like to win and their name within their comment. Entries without names cannot be matched and will be disqualified. Finally, Tiger Tribe and Six Little Hearts are not responsible for prizes not reaching winners in time for Christmas. Every endeavour will be made to meet this deadline however! Please share this fantastic Tiger Tribe giveaway with your friends and family on your social media and spread some Christmas cheer! 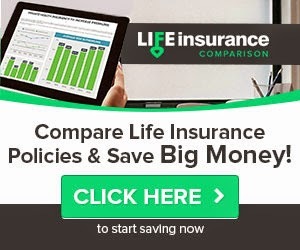 All options are below this post. 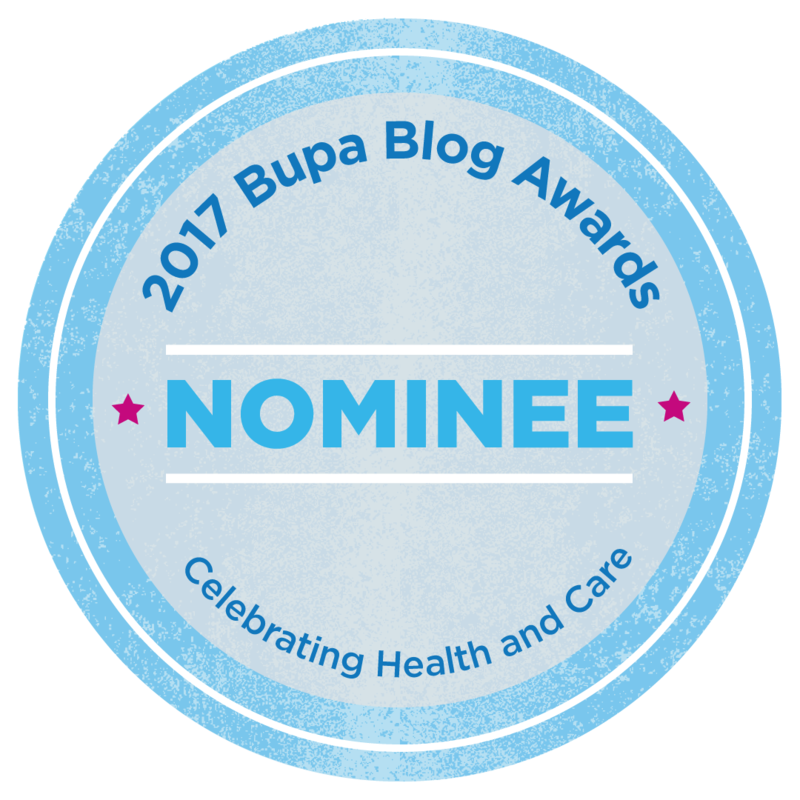 All glowing opinions expressed are genuine and entirely those of this blog's Author and family. Thank you! Nestlé Healthy Active Kids Initiative and WIN Foodie Prize Packs for Kids! How Do You Sell a Home? 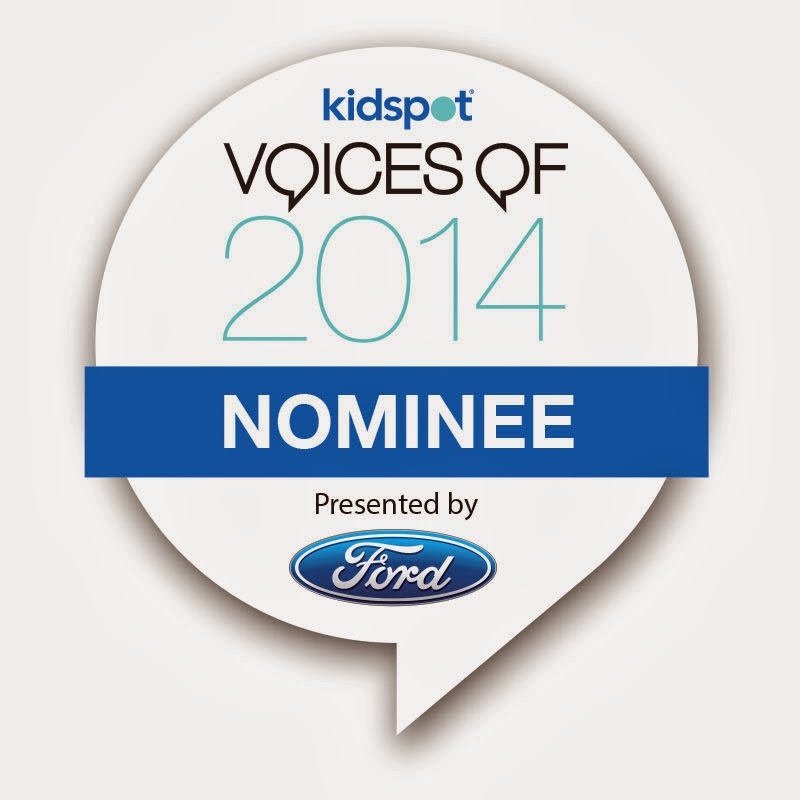 LeapFrog Epic Tablet PC for Kids Review and WIN an Epic Worth $199! 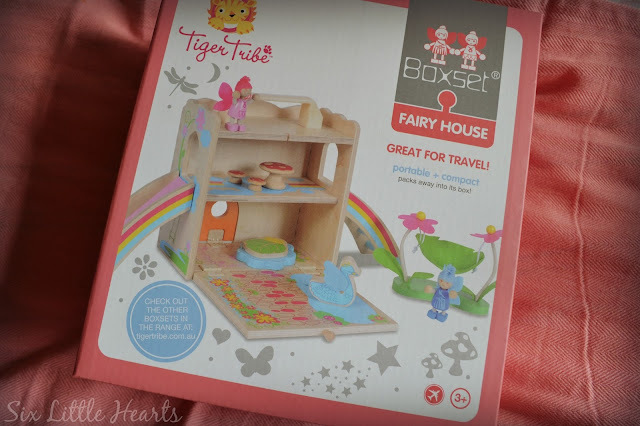 Tiger Tribe Toys are beautiful, creative and very well made, my toddler granddaughter, Florence-Rose, would be absolutely besotted with the FAIRY HOUSE BOXSET, keep her entertained forever. Thank you so much! Can't wait to play pirate! You'll have a ball! It's loads of fun - enjoy. I love that Tiger Tribe Toys are creative. My eldest would love the Tiger Tribe's drawing sets he trying really hard to improve his drawing. I wish I had more to offer! So many lovely responses here and so few toy prizes by comparison. Tiger Tribe Toys always combine the function of being fun with the added advantage of there always being something to learn. The carry along Kitchen is perfect for keeping my little visitor occupied which I cook in the big kitchen. I love Tiger Tribe toys because they are colourful ,have unique designs and bring the opportunity to learn with them.Moreover they have great quality and are strong enough to handle the love of over-active kids. 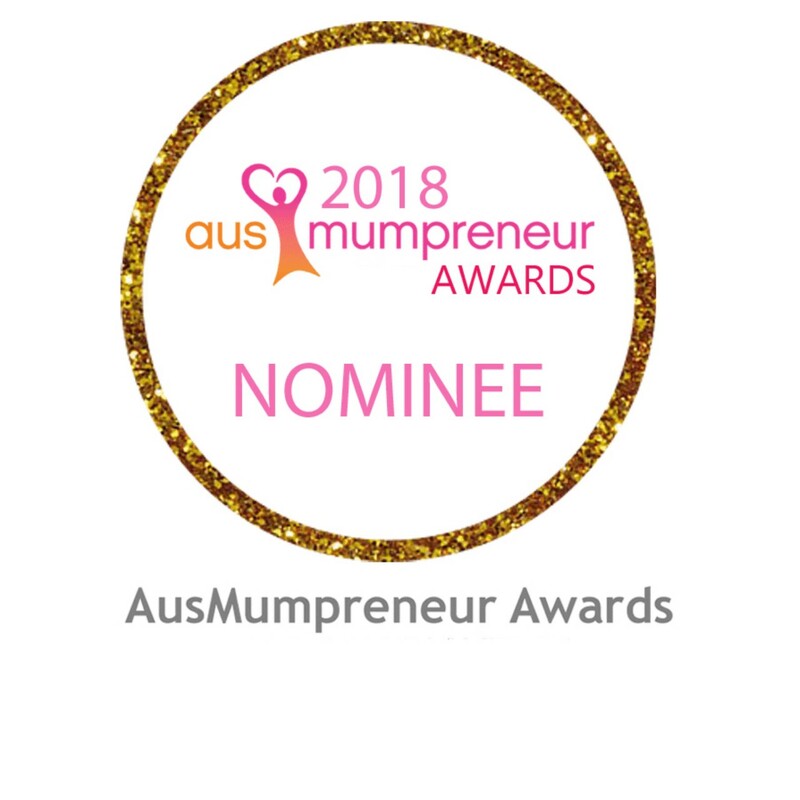 I would love to win Tiger Tribe's Magnificent World of ABC for my son who is going to start kinder next year and is showing interest in learning alphabets these days. yay.. Thankyou so so much. x Toni. Sorry I don't have enough to go around! Such gorgeous toys - but how cute is that kitchen! I use to have a tea set like this one. I loved it and wish I never gave it away. 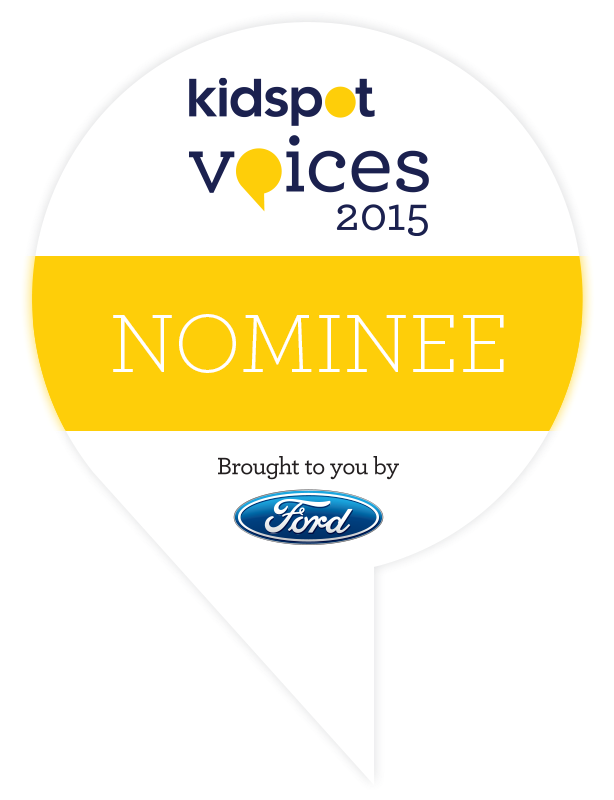 Would love the chance to win the Boxset Role-Play Kitchen. These are quality toys and would keep my little one entertained while I cook dinner. I'll get to (pretend) eat what she has cooked for me and she'll need to eat what I cooked her her. Would love to win the Vintage Tea Set - Rainbow Hills for my little girl for her little play kitchen as she hasnt got a tea set yet and also she can then make her older brother play tea parties with her, which would be fun to see. Tiger tribe toys are great quality and cater for all ages and last unlike the plastic toys you get from target etc. 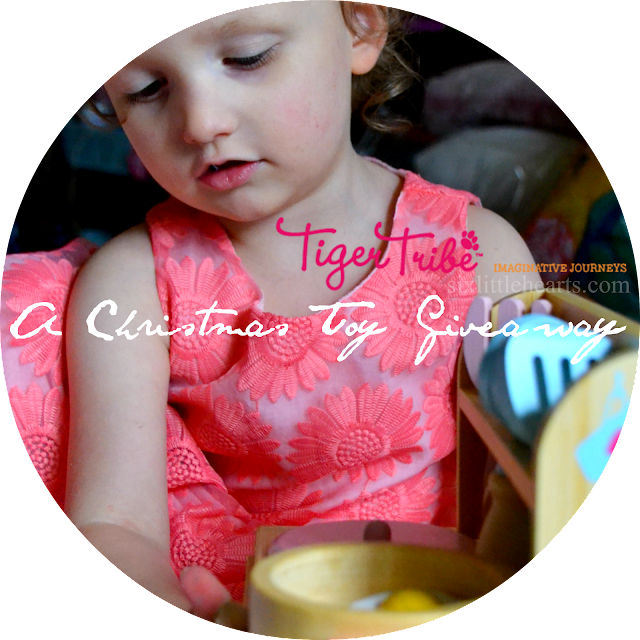 Tiger Tribe are great educational toys. I've got a few as stocking stuffers this year including the pocket kite, which I plan to leave in the glove box of the car. The customer service is also outstanding. Fairy house boxset, perfect for my 3 daughters. My boys have had Tiger Tribe box sets for years now and they look just like the day they got them. I love that 3 kids couldn't dent or scratch them or destroy them in any way!!!! and I love the doors come off without breakage!!! My daughter carried her brothers box set all the way to town and the park today and she loves the carry handle. I would love a Fairy Box Set for my Fairy loving little girl. I am planning a whole fairy garden for her 3rd birthday coming. P.S. No batteries!!! That takes the cake for this mum to 3. Natalie, such a shame you haven't filled out the Rafflecopter form correctly as I would have considered you for a prize! Maybe next year will be the kids and my year. Tiger Tribe makes such fun, bright toys, it makes me wish I was a kid again so I could buy them for myself. I guess having kids means I can, and just say it's for the kids! 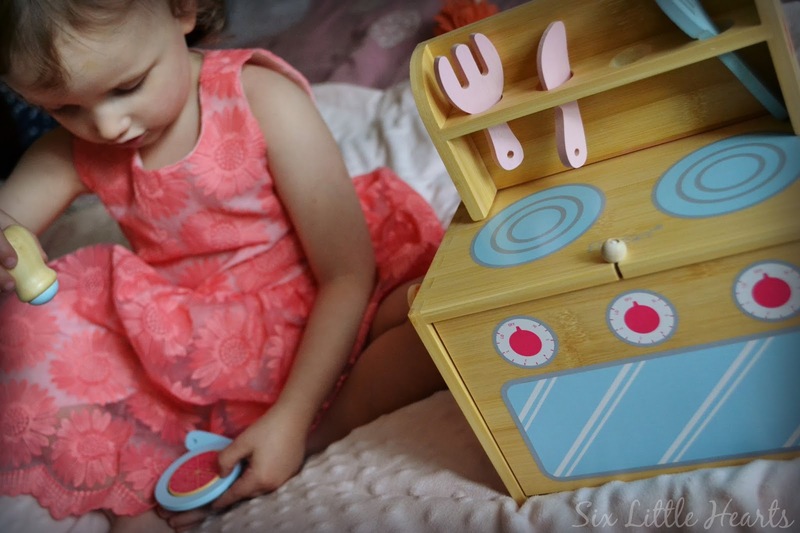 I would love the Boxset Role-Play Kitchen for my little girl who loves to watch me cook! I think the Vintage Tea Set is beyond adorable, from the gorgeous & vibrant design to the practical (made of tin so no accidentally breaking anything). Tiger Tribe have a great range of fun and educational toys, at affordable prices which is awesome! 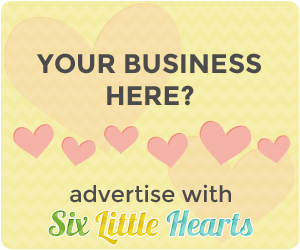 Started by 2 busy parents, with products designed & illustrated in Australia, Tiger Tribe are now one of my go to websites when I'm after something quality and fun for the kiddies. Not like the nasty plastic that ends up in the bin! But the Box Set Role Play Kitchen would be absolutely perfect! Creating all sorts of goodies for my tummy. Yup that's ME, Christial Shea! I love Tiger Tribe toys, there is a toy shop near me that sells lots of their things. 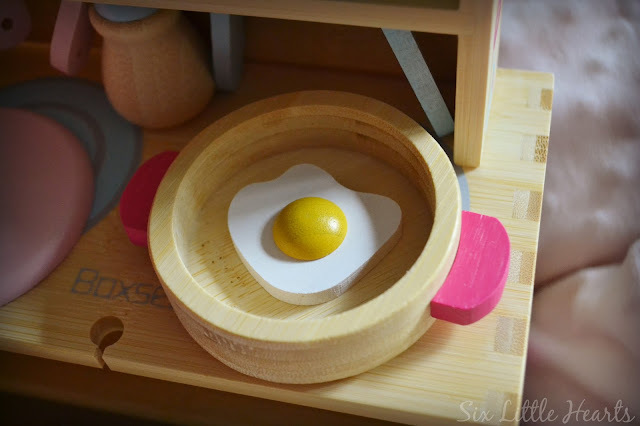 The kitchen is very cute, love the egg! The egg is adorable isn't it?!! Merry Christmas! 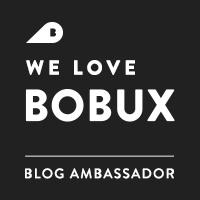 What awesome prizes! I love Tiger Tribe and particularly love the Boxset Fairy House, as my kids spend time at their gran's house and it'd be so easy for them to take it with them to play with there. The skittles look great perfect for playtime away from a screen. I love how many wooden toys are available on Tiger Tribe. The kitchen set would go lovely in our playroom! I love Tiger Tribes wonderful creative toys that let kids go crazy with their imagination....I really adore the Wooden Skittles - Pirates. So much cute - that kitchen is adorable! 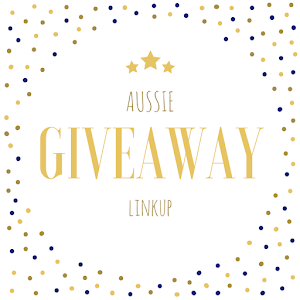 Wonderful giveaway thank you - and some awesome Xmas shopping inspo! Using imagination all the while. Tiger Tribe on the floor or in the chair! 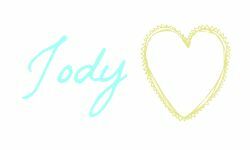 thoughtfully-designed toys and gifts, and more! One sibling to another, they can be passed along! Perfect gifts for Christmas or a birthday! What a wise child! Very sweet little rhyme and I am sorry my prize chest is now empty. What a fabulous giveaway. Wishing Tiger Tribe was around when my three were little they would have loved all of their range. Anything cooking with her is a hit! She finds it a snitch! My 2 year old daughter would LOVE The Boxset Role-Play Kitchen, she would get so much enjoyment out of it and might even keep her out of my kitchen cupboards for a few minutes! My twin girls would LOVE the little kitchen! It would look so adorable in their room and I imagine them making little meals for each other, so cute! I love the Tiger Tribe toys because they remind me of the toys I had when I was a child! I love the fact they are simple, no flashing lights or noise, just beautiful toys ready for the imagination. I'd love to win the Vintage Kitchen Set for my son because it's his birthday on Thursday and his grandparents bought him a kitchen for his new cubby house and this set would go perfectly! We have the Tiger Tribe vintage tea set and it is just divine! The girls love it! I would absolutely love to get my hands on the How to Draw Animals kit. My eldest daughter Punky loves drawing and has a real talent for it, but it's really hard to find How to Draw books for kids as young as she that she can actually do. This kit looks perfect! The How To Draw Animals kit is just right. Perfect for doing together with my daughter. We would love the roleplay kitchen because our family are foodies. Both my and myself are chefs so our kids are always pretending to cook. This prize would only bring their imagines to life. To go with her Billie dolly. Fun toys for girls and boys, a little bit retro a lot a bit new, Tiger Tribe is a blast knowing things are built to last! Im impressed by the Boxsets being the best travel toys I have seen yet! The Tiger tribe toys encourage learning through play and foster imaginative play. I love the kitchen! 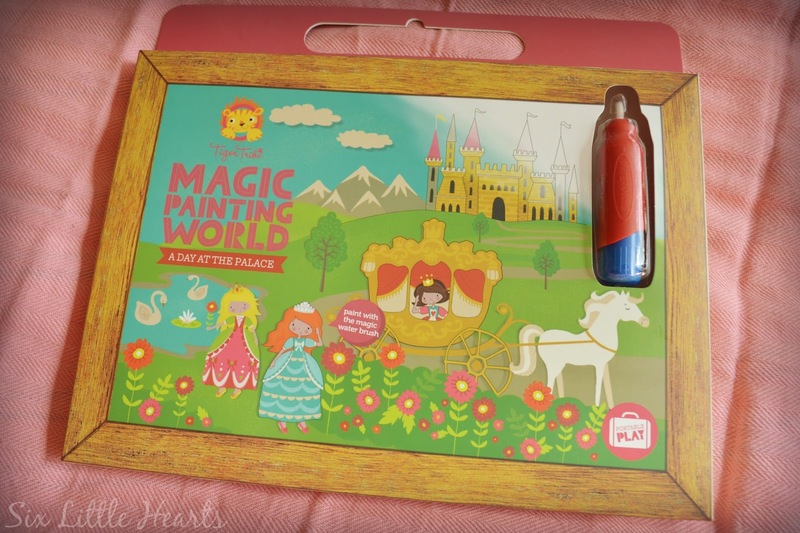 I would love the Tiger Tribe Magic Painting World -Things That Go for my little girl. I know you referred to these as the set for boys, but I like to keep things gender neutral. In fact my daughters favourite things are planes, dinosaurs and pirates all things that once would have been considered thing for boys. Love the little play kitchen, It is small enough to pop in the car when we go on holidays or take to nannies. 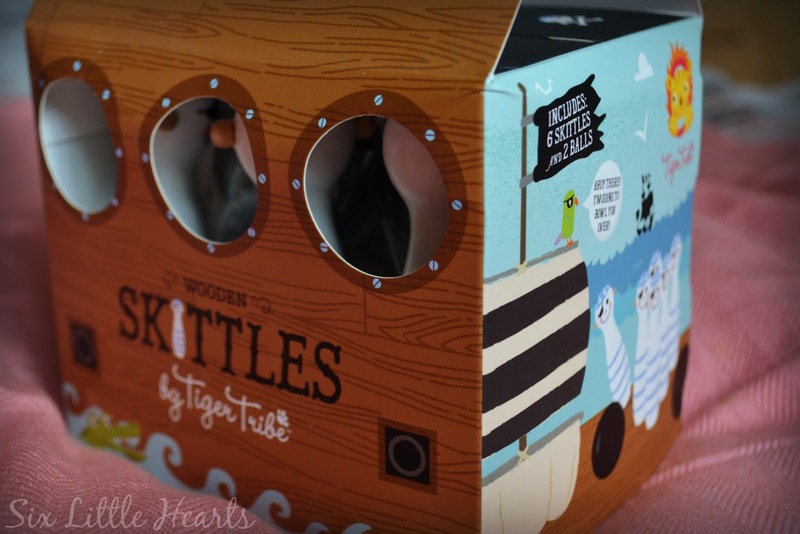 I would love to win the Tiger Tribe's Wooden Pirate Skittles for my nephew. I am always trying to find new ways to play and teach him new things - I think he would absolutely LOVE this. I love the quality of Tiger Tribe toys (not made of plastic), and that they have no batteries! Back to traditional toys! My son would love 'The Magnificent World of ABC' set. He's very keen to learn his letters, and I'm very keen for him not to only learn his upper case letters! The Tiger Tribe set is perfect for this as it contains both upper and lower case magnets. With baby number 2 on the way, our 4 year old could also play parts of the set independently, while I feed the baby. Win-win! I wish I had two! All the best with the new baby on the way! Tiger Tribe Toys remind me of my childhood toys. I had a lot of gorgeous wooden toys, a fabulous metal tea set and beautiful original books. I would love to win the Wooden Pirate Skittles, this is a great toy that the whole family can play. 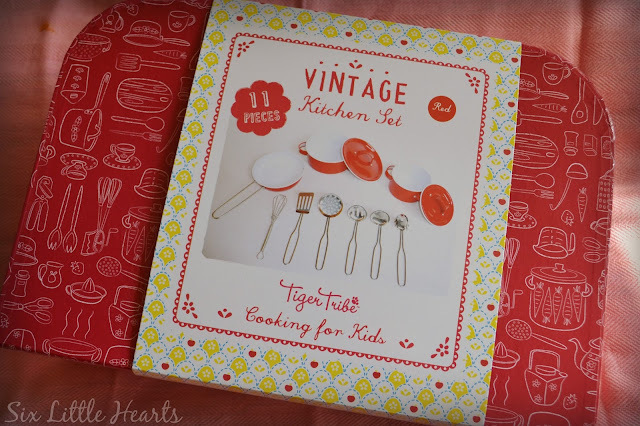 Love the Tiger Tribe Vintage Kitchen Set, so many great toys that remind me of my childhood and so well made. They are something that can be put away once outgrown to keep for when the grandchildren come along. I love Tiger Tribe toys because they look like well made toys which is hard to come across now days. 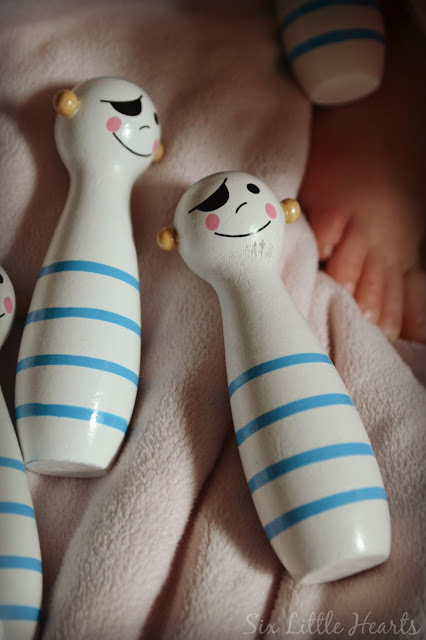 My favourite item is Tiger Tribe's Wooden Pirate Skittles as they are super cute and can be taken on the road or when away from home. Tiger Tribe keeping kids and adults imaginations alive. I (I mean my daughter) can't wait to have a tea party with Tiger Tribe Vintage Tea Set Rainbow Hills, with all the new teas out on the market it is going to be fun long party.